Volcano Hunter Snyder has the ball but a sea of Tigers, led by No. 2 Cody Callahan, stand between he and Chester’s Devon Dye. Portola boys won a victory over visiting Chester Vols on Jan. 28 by a score of 61-59 but it sure wasn’t easy. The first quarter of the game the Tigers took the lead 14-5 and it seemed the Volcanoes all but surrendered by the half with the score 33-15. CHS head boys’ basketball coach Aaron Hardesty and the Chester team must have come up with something pretty sensational because those Volcanoes fired up to a burning inferno after the half; it was a whole new ball game. 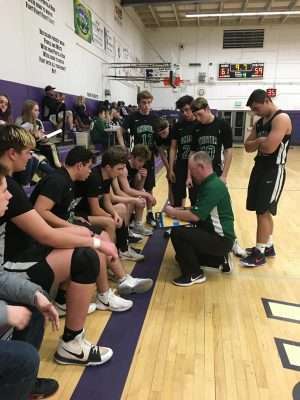 Chester put 26 points up on the scoreboard in the third quarter while Portola kept steady with 14, wrapping at a close 41-47 before the final quarter began. The last period was hot, heated and boiling, as the Tigers defended their goal while steadily scoring. 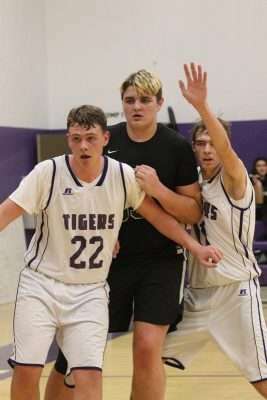 The Volcanoes had another big rush at the goal adding 18 and chomping on the heals of their hosting Tigers, but they were never able to actually cut in front of the Portola boys that night. The Tigers added a total of 14 points in the last quarter to end a game that was riveting until the final buzzer declared PHS victorious. 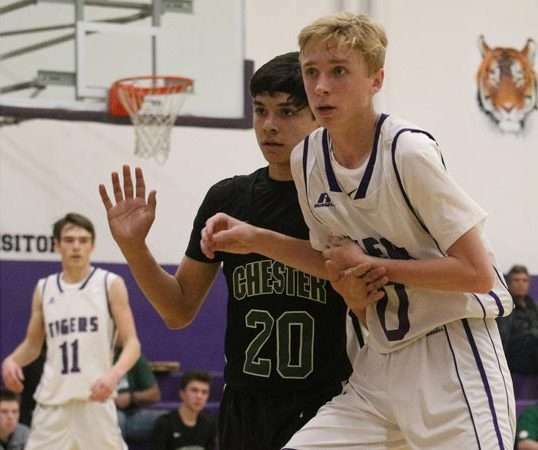 The Chester boys brought themselves up to battle in one of the most exciting games of the season. The ferocious Tigers persevered to win on their home court. 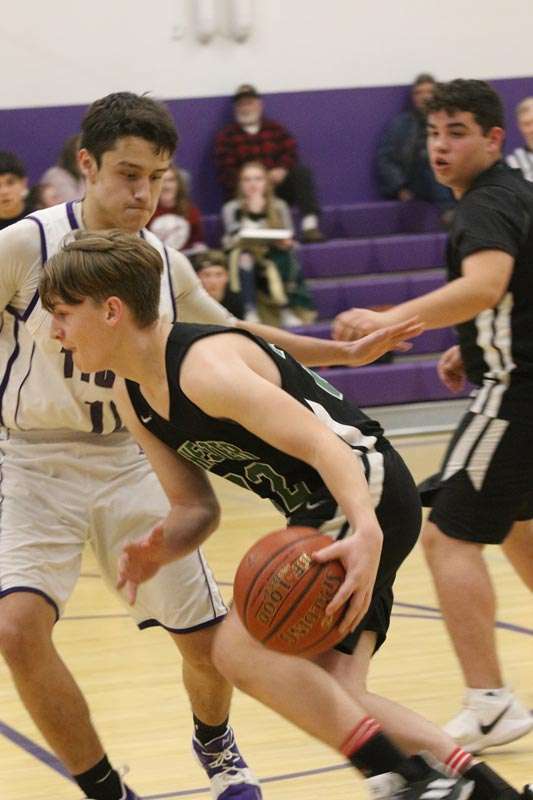 The PHS boys were extremely steady, scoring an even 14 points in three quarters with 19 to widen the margin and double their opponent’s scoring before the half. Leading the Tigers, without a doubt, was junior Keegan Folchi with 28 points. Folchi landed seven of his 11 free throw opportunities and five big 3-pointers. PHS junior JT Massey scored 14 points and junior Cody Callahan added 6. Also scoring for the Tigers was James Sampson, Shane Curren, Mario Ruiz, Ricky Johnston and Owen Bowling. Senior Ricky Johnston has a real knack for rebounds picking up 13 for PHS. Callahan snagged six and Folchi gathered five. The whole PHS team did their part picking up rebounds to win the Tiger advantage. Ruiz led with four turnovers, Callahan and Johnston made three and Bowling, Massey, Curren and Dylan Gonsalves instigated two. Folchi stole the ball three times. Callahan, Massey and Johnston stole it twice each. The fighting Volcanoes were led by junior Devon Dye who scored 35 points. Dye hit nine of his 11 free throw shots. Sophomore Kameron Stelzriede landed a trio of 3-pointers with a total of 10 Volcano points. Sophomore Nick Brent scored 7 points and junior Hunter Snyder landed 6. Also scoring for Chester was senior Eric Pacheco. The Volcanoes are 15-7 overall and 3-3 in the Five Star League. The Vols finished their season with a pair of away games against Loyalton and Burney. Chester sits in the middle of the pack in their league. The Northern Section Playoffs schedule is not yet posted. The Tigers are 7-15 and 4-3 in the Mountain Valley League. They too sit in the middle of their league pack. 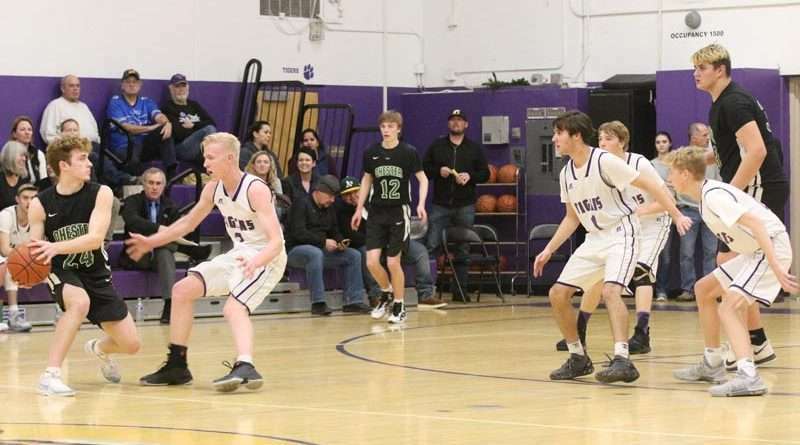 The Portola teams will travel to Biggs to play the Wolverines tonight, Feb. 6. However, the Tigers have one more game for PHS fans to support. Tiger no. 22, Ricky Johnston, and No. 11, JT Massey, hamper the efforts of CHS top scorer Devon Dye. This Friday, Feb. 8, the Tiger boys take on the Esparto Spartans starting at 6:30 p.m. Not to be missed, the lady Tigers meet the Spartans on the court at 5 p.m. Playoff schedules will be covered in this Sports Section as soon as they are published. Volcano no. 20, Justin Contreras, wisely guards top scoring Tiger Keegan Folchi. CHS guards assigned to Folchi were relentless. Tiger Mario Ruiz tries to block Chester Kameron Stelzriede.